NUFC FANS FOODBANKSUNITY IN OUR COMMUNITY! Pre Crystal Palace match we rocked up as normal, 1pm, at the NUFC Fans Foodbank stall opposite Nine Bar –plastic bag in hand with this week’s donation- in order to report in for volunteering duties. As usual, a steady stream of fans dropped by with donations, others calling by to drop some change in the collecting tins. As well as being a great cause the stall has become a hub of pre match activity with many fans having a good chat when calling by, either about the forthcoming match, or indeed any number of other NUFC related topics. On Saturday pre Palace, local reporters George Caulkin and Luke Edwards were spotted, along with Mike Martin from NUFC fanzine True Faith, I Daniel Blake actress Sharon Percy. NUFC Fans Foodbank enthusiasts Bill Corcoran and Steve Hastie were both there chatting about all things NUFC. Together with all of the willing volunteers led by the ‘Boss’ Mike Nixon it makes for an interesting couple of hours before the match…….and then around 2.30ish the highlight of the day. The lads and lasses from Wor Hyem and Wor Flags came marching along Strawberry Place, flags flying, carrying banners, singing at the top of their voices and at the front carrying a new Banner ‘Support NUFC Fans Foodbank’, to call in on their journey from the North Terrace pub to the Gallowgate via NUFC Fans Foodbank stall! 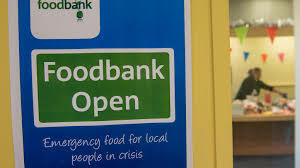 Very emotional I have to confess, and what an atmosphere when they arrived at the Foodbanks stall to hand over their donations and collections as well as the banner ‘Support NUFC Fans Foodbank’. There followed plenty of backslapping, hand shaking, singing and even Foodbanks leader Mike Nixon was hauled in front of the banner for a photograph. Thanks to Wor Hyem/Wor Flags and the North Terrace it’s greatly appreciated. Fans working together! I felt really proud to be part of what we are doing for those within our community less fortunate than ourselves. Unity in the Community!